Which, to the average reader, might not make much sense. Or if it does, might not seem like that big a deal. Pfft, such a thing to complain about. Writing things down? Setting a timer? Oh, but I shook my head with great understanding and agreement, as did her other pals in the biz. When it’s your job to create and test recipes, no move in the cooking process goes unchronicled. What size jar was that sauce and how many cups did it contain? The large zucchini measured how many cups when sliced? Exactly how many minutes did it take for the crackers to hit that necessary balance of firm-and-lightly-browned? Every detail monitored, scrutinized, noted, updated. For years now, I’ve felt that one of my dirty little secrets as a cookbook author is how seldom I cook from books in my own kitchen. Once I leave work mode behind (the article with recipes has been submitted, the cookbook manuscript finished, the recipe development project completed), I want to just follow my whims and cook off the cuff. Of course, absolutely, cookbooks figure in that creative process, their recipes serving as starting points, inspiration, elements in my master plan. But I fall short on measuring ingredients, setting timers, and following directions closely much of the time. It’s incredibly liberating to JUST COOK in, and for, the moment. The menu featured a few of his favorite things. The cold weather inspired a soup course. Maybe a really great seafood chowder, I thought. And he loves crab or lobster bisque. But we live in Seattle, so CRAB for sure. Plus the fact that crab season just getting underway, no hesitation there. 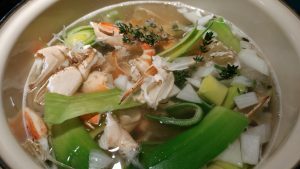 My starting point was a Crab Whiskey Soup in my Crab cookbook, though I nixed the whiskey and used a bunch more crab just to be decadent. I wanted to upgrade it a bit, and we love the nutty-earthy flavor of celery root. Do I make more of a crab chowder and used celery root instead of potato? 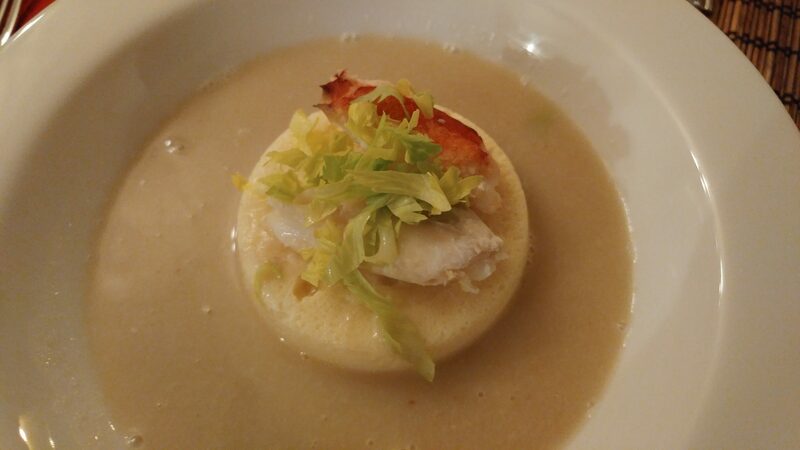 Do I make a creamy pureed celery root soup and add crab to that? I have another soup in that cookbook that makes a mousse of crab to serve in the center of a vivid pea soup. How about reversing that? Celery root in the center, crab soup around. Voilà. A cohesive plan of action. I picked out nice whole leg pieces for garnish and set them aside; about 3/4 of the rest of the crab went into the soup to simmer a bit for flavor-melding, then a good whirl with the immersion blender. The last bit of crab went in and one final quick whirl to chop just a little bit but keep some texture. celery root flan was based on input from Michael Ruhlman in his book Ratio: chunks of celery root simmered in half-and-half until tender, pureed, 1 egg added per 1/2 cup puree; season, pour in ramekins, bake in water bath until set, 30 minutes or so. upturned flan in the center of shallow soup bowls, topped with a crab leg or two (or three for the birthday boy), a scatter of slivered celery leaves, hot soup all around. All there is to it!! Both the soup and the flan had simple, delicate flavors that worked really well together. I’d absolutely make that again. If–that is–I can retrace even my own steps. But if not quite exactly replicated, surely something delicious will come of it.